Successfully Added DVB-T USB Dongle - Free Digital TV and DAB+ on Your Computer to your Shopping Cart. Watch free DVB-T digital TV and listen to DAB+ (digital audio broadcasting) on your computer! This impressive USB dongle contains a powerful digital TV receiver that allows you to watch crystal clear digital programming on your desktop PC, notebook, laptop, or netbook. Included with this USB dongle is a digital video recording (DVR) software package that lets you schedule recordings of all your favorite TV programs to watch whenever you desire. If that wasn’t enough, the K84 even comes with a DAB+ receiver! Why is DAB+ so cool? Because DAB+ receivers (like this one) are able to receive both DAB and DAB+ radio broadcasts which means with the K84 you'll be able to enjoy all the news, music, and talk shows you crave, all in your own language! This incredible USB dongle is extremely easy for anyone to use. Simply install the included software CD, plug the DVB-T dongle in to any USB port, open the DVR software, then sit back and enjoy hours of premium digital television and DAB+ radio at your fingertips. The CVMK-K84 even comes with a remote so you can operate the receiver the same way you would a traditional TV. 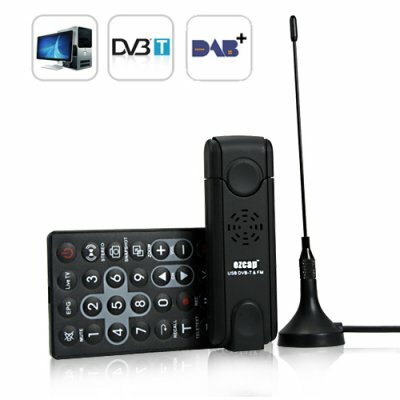 If your computer has an "A/V out" connection you can even send the digital TV signal to your primary television, so you can enjoy hours of free DVB-T digital TV programming on not only your computer, but your big screen HDTV as well! At a great factory direct price the K84 is an inexpensive and safe way to enter the resale market. Order your bulk orders now for an even better wholesale price and start generating some serious profits for your online or retail store. The K84 is in stock now and ready for immediate shipping. Another resale friendly item brought to you by the leaders in factory direct electronics, Chinavasion! Evaluate the included basic DVB-T software for yourself. You may decide you need more advanced features, in which case we recommend that you try out some of the popular open-source titles or purchase a commercial DVR software package. Can I use different DVR software with the CVMK-K84? yes it works in australia for fm dab and tv very good unit. Professionally built and excellent functionality. Very easy to install. Super fast delivery. Very high standard from Chinavasion. Funciona muy bien tanto la TDT como la radio FM como la radio DAB, incluso en zonas de poca señal, muy fácil instalación y configuración, producto recomendado 100%. El envío fue muy rápido. It works very well both the TDT like FM radio and DAB radio, even in areas of low signal, easy installation and configuration, which is recommended 100%. The shipment was very fast.